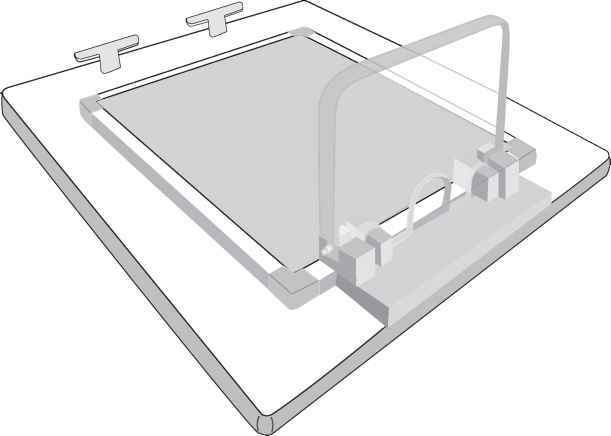 Figure 1-1 Figure positioning equipment. A modified version of the traditional "Bird Board" is commercially available and allows for direct contact of the bird and the radiographic cassette. Figure 1-2 Positioning technique for the laterolateral radiographic study of the avian head. The bird is placed in right lateral recumbency with the head resting on the cassette. Stabilization is achieved using radiolucent tape to secure the maxilla and mandible. Care should be taken to avoid applying tape over the eyelids. The x-ray beam is centered ( + ) ventral to the eye, and the x-ray beam field (dotted lines) includes the entire head and extends to the cervical region. Use of positioning device is optional. A metallic "R" marker is placed on the radiographic cassette indicating that the right side is dependent. can be removed easily with minimal residue left on the feathers, and is less radiopaque than fabric tapes. The ends of the tape are folded over on themselves for approximately % (0.25) inch to facilitate tape removal when the examination is complete or if patient repositioning is required. Laterolateral radiographic studies in this text were made with the bird in right lateral recumbency (i.e., the right side of the bird is on the x-ray table or positioning device). 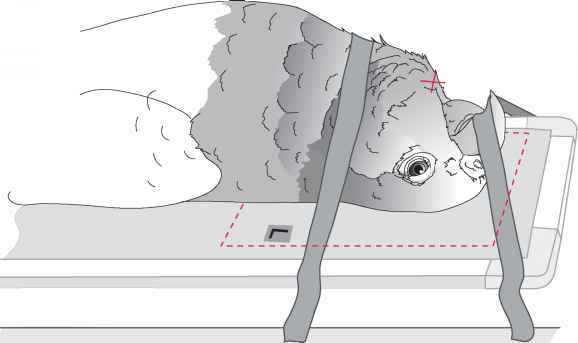 The laterolateral positioning technique begins with placing the bird's neck in the cervical restraint portion (guillotine) of the positioning device. The body is then gently moved cau-dally to reduce curvature of the neck. Further gentle traction is applied to the bird's body by immobilizing the legs with tape or strips of bandage gauze attached to the positioning device. To immobilize the legs, bandage gauze can be looped around the distal tarsometatarsus of each leg and then attached to the cleat on the positioning device. The dependent leg is positioned first, and the contralateral leg is then superimposed on the dependent leg. Occasionally, small pieces of radiolucent sponge are placed between the legs to minimize rotation. Finally, the wings are fully extended dorsally to minimize their superimposition on the cranial dorsal thorax, especially the pulmonary parenchyma. To minimize rotation of the body, the wings should be secured individually using tape. The dependent wing is positioned and taped first. Two pieces of tape are used and crossed at the carpal region of each wing separately. If necessary, another piece of tape can be applied across the wings in the humeral region. The primary flight feathers can be separated to allow increased contact between the tape and the surface of the cassette, positioning device, or table. Rotational malpositioning of the body can be associated with asymmetric leg extension or if excessive pressure is applied to the upper wing when it is secured. A metallic "R" marker is placed adjacent to the bird, indicating that the right side is dependent. Proper positioning is confirmed visually and by palpation of the sternum and vertebral column. 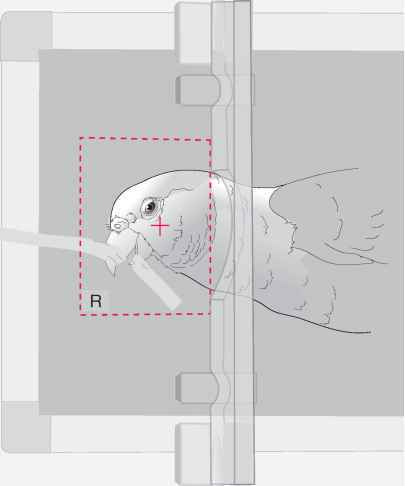 Figure 1-3 Positioning technique for the ventrodorsal radiographic study of the avian head. The patient is positioned in dorsal recumbency. Radiolucent tape is applied to the ventral aspect of the rhinotheca to hyperextend the maxilla at an angle closer to the radiographic cassette. The x-ray beam (+) is centered between the eyes on the midline, and the x-ray beam field (dotted lines) includes the entire head and extends to the region of the cervical vertebrae. Metallic "R" and "L" markers are placed on the radiographic cassette indicating the laterality of the patient. other. 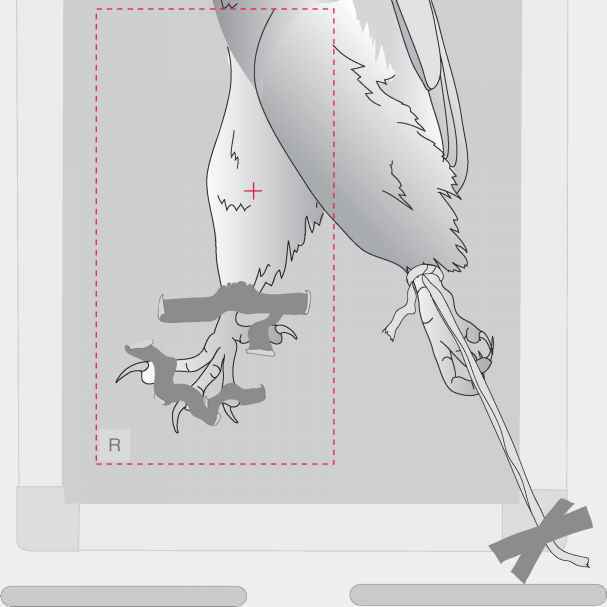 The authors prefer this method of positioning because it results in less rotation of the bird's body. Because the dependent extremities are closer to the film or digital sensor than the contralateral extremity, the dependent extremities can usually be differentiated. Cortical borders are sharper and the bones are less magnified than in the nondependent extremity. In smaller birds, laterality can be difficult to determine because the magnitude of magnification in the nonde-pendent extremities is minimal. An alternative technique to superimposing the extremities is to position the dependent extremity slightly cranial to the contralateral extremity, but this may result in rotation of the body (Figure 1-4).